Lemon Basil Quinoa Pilaf is a colorful side dish or light main course packed with protein and sunny mediterranean flavors. I first wrote about Quinoa Pilaf two years ago, when I was new at blogging and took blurry iPhone photos. Nevertheless, I was eager to show you how to take my favorite grain in multiple directions. Eighty two posts later, I thought it was time to revisit this gluten-free “Supergrain of the Andes” and showcase both the variety of quinoa at the grocery store and infinite, EASY ways to make it at home. Find out more about the amazing benefits of quinoa here: 27 Surprising Health Benefits Of Quinoa. For more recipes with grains and vegetables, check out Cranberry Wild Rice Salad, Baked Pasta Primavera, Pepper ‘N Rice Bake, Easy Paella and these Yummy Stuffed Peppers and Squash. This recipe is a great starting point for your favorite grain or legume substitutions. I like to make a big pot of quinoa, rice or lentils on Sunday to use in combination with different vegetables or protein all week long. STRETCH THIS RECIPE: Instead of quinoa, use combinations of beans and grains or lentils, farro, barley, pasta or couscous. Cut peppers into fourths around the stem in order to easily remove seeds, then cut into strips and chop into small, bite sized squares. Double duty: Toast pine nuts on one pan while roasting peppers and garlic on another pan, all at the same time. Nuts will take only ten minutes to brown, while the peppers and garlic will take about 25 minutes. Remove and let cool while you prepare quinoa and other ingredients. Rinse well to remove any bitterness. Before adding liquid, stir the grains while dry (or with just a teaspoon or two of mild olive oil) over medium heat, about 5 minutes, until the grains start to pop and brown. This adds a rich, nutty dimension to the quinoa. I like to make quinoa with water instead of broth so that I have the flexibility of using the extra quinoa for a sweet pilaf in the mornings. Make double the amount of quinoa and reserve half the cooked quinoa for another use. Freeze the extra quinoa for easy meal prep next week or tomorrow’s breakfast with your favorite fruits, nuts and milk. While the quinoa cooks, chop basil into shreds, then measure out and set aside ingredients. Make ahead tip: roast vegetables and nuts, make dressing, chop basil and tomatoes and crumble or cut cheese a day or two before serving the pilaf. Measure out, cover and store ingredients in the fridge until you are ready to assemble the pilaf and serve. I always set aside extra herbs, cheese and nuts to garnish the plates or bowl of quinoa for that extra finishing touch. Pour half the dressing over the hot cooked quinoa to allow the flavors to absorb, then fold in peppers. Taste and adjust seasonings and add more dressing as needed. JUST before serving, add in cheese, basil and pine nuts. Serve the remaining dressing on the side. This pilaf is as beautiful to look at as it is to eat. The roasted peppers and sundried tomatoes add gorgeous pops of color. As the quinoa absorbs the bright lemon and oil dressing, the flavors actually improve on day two. Serve over salad greens or alongside your favorite roasted or grilled steak, chicken or tofu. Dig in to Lemon Basil Quinoa Pilaf, the delicious starting point for your own creative grain and vegetable combinations in 2016! 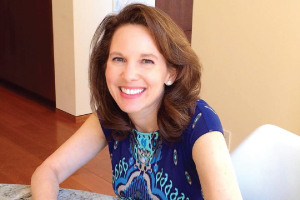 Share and post your pilaf ideas on Instagram with #diginwithdana or leave comments and ratings below. Sign up for weekly recipes above on the home page or contact me at dana@diginwithdana.com. Lemon Basil Quinoa Pilaf is packed with the sunny flavors of lemon juice, fresh basil, sun-dried tomatoes and feta cheese. Grains + vegetables simplify mealtimes. Use this pilaf formula to create variations of grains or legumes and seasonal vegetables all year. Preheat oven to 375 F. Line two baking sheets with foil. Prepare vegetables: Chop both peppers and place on lined baking sheet with two cloves of garlic. Toss peppers and garlic with just a few teaspoons of olive oil and sprinkle with a little salt and pepper. Place pine nuts on other baking sheet and roast nuts for 10 minutes and peppers for 25 minutes. Let nuts and peppers cool, then remove garlic peel and mash pulp. Chop sundried tomatoes and set aside. Prepare quinoa: Rinse quinoa until water runs clear. In a deep saucepan over medium heat, stir dry grains with 1 tsp oil (optional) for five minutes, until quinoa starts to pop and brown, Carefully add water or broth. Bring to a boil, then reduce to a simmer. Add a pinch of salt, cover and cook ten minutes, then add in chopped sundried tomatoes and continue cooking covered another five minutes, or until all liquid is absorbed. Remove from heat and let steam five more minutes covered. While quinoa cooks, prep other ingredients: Slice basil into ribbons and measure out crumbled or cubed feta. Make salad dressing: Combine 1/4 cup lemon juice, 1/2 cup olive oil, mashed garlic pulp ( use one or two cloves) and salt and pepper to taste. Blend well and set aside. Fluff the warm, cooked quinoa and add just half of the dressing. Then add in roasted peppers. Stir and adjust for seasonings. At this point, pilaf can be covered and refrigerated up to two days before adding in other ingredients and serving. Just before serving, taste and add any additional dressing, salt and pepper. Then gently stir in basil, pine nuts and feta cheese. Serve with additional dressing and garnish with whole basil leaves, additional feta and pine nuts. Serve cold over greens like arugula or hot alongside your favorite entree. See blog post for additional helpful tips and photos. Nutritional Information using just 1/2 of the lemon and olive oil dressing. 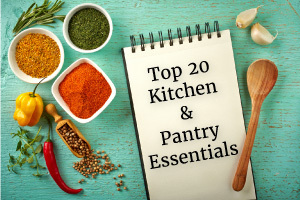 Receive new posts in your inbox and your free "Top 20 Kitchen & Pantry Essentials." You agree that you will not modify, copy, reproduce, sell, or distribute any content in any manner or medium without permission, and will link back to Dig in with Dana if you adapt any recipes.